Did you try that red tank and snorkel with HEET? And if so, how much did you put in it to try to start it? Something that size I would put about a liter or .75 liters at least to test it. If you don't put enough fuel in, it can chuff and flameout. You'll need to try it several times and air it out each time to be sure. And just try it straight up at first not sideways if you haven't already. The pipe also needs to be smooth without any welding blobs or rough edges on the inside of the pipe because something as simple as that can defeat you. It has to be neat or else it can create too much turbulence as the air flows in and out. Use a file to smooth any rough edges at the inside ends of the pipe if it needs it. I can't tell how many liters that red tank is with the snorkel attached but it should tolerate that short of a snorkel at a 2.5 cm diameter although it will certainly whoosh loudly the first time you light it with methanol, protect your ears. If that one doesn't sustain, then yes you can put the 2.5 cm snorkel on the other tank you have. And then you can also try the next size up pipe diameter on the one you are planning to take the snorkel off of if it doesn't run with that 2.5 cm snorkel. Here's three of my snorkelers side-by-side. The snorkel diameters are 3/8 inch, 3/4 inch, and 1 inch or 2.5 cm for you. The 3/4 inch and 1 inch diameter snorkelers - the larger tank is 7 inches or 17.78 cm in diameter. Now look at this terrible mismatch of my old scuba tank that I used to dive with in the Florida Keys when I was about 12 years old. The snorkel on that very large tank is only 3/4 inches in diameter or about 2 centimeters. And it runs for 5 minutes easily but it's bogged down because the snorkel is too small but that's the only one I could use that matched the threads on the tank. Methanol is your friend. Also this tank may be a little tall for the width of the tank. One other thing just to be clear, that tank you just posted with the snorkel might be better with the next size up snorkel diameter, something with an inside diameter of 3 centimeters instead of 2.5. With the scuba tank I have, I don' think it likes to run standing straight up because it's so long and narrow that maybe the fuel has a hard time getting heated enough initially, like a very tall narrow jam jar that sometimes flames out when you go to start it. Sometimes if you get a particularly loud and sudden blink of an eye whoosh on the first try and it flames out, if you air it out partially, the second try will often slow the flame front down enough that it sustains. Tested the old tank with methanol, works good! I did weld a snorkel to it but it barely even wooshes..
And now when I cut the pipe (that I welded a bit skew) it wont run at all.. If it's cold out methanol can be sluggish say like if you lived in Finland. If you warm the tank very slightly, the first try will often whoosh so loudly it kills your ears. You have to air out a snorkeler each time you try it too. If it's very cold out and it whooshes very slowly as is often the case you can't just try to light it again without airing it out thoroughly. That means putting a hose of some sort down the snorkel and deep into the tank and injecting fresh air from some source like an air compressor or air pump of some kind. You can also after adding methanol invert the tank with a stopper in the snorkel and coat the entire insides with methanol. That can make for a more perky start. You should never have a weak starting whoosh that you give up, with such a large snorkeler. "I did weld a snorkel to it but it barely even wooshes." That tank that you just posted had a rather tame start to it, but believe that same tank just as it is will fire off quite suddenly if you get the fuel/air ratio and temperature correct using fresh methanol. You can go overboard and warm the tank too much which will make the mixture too rich. That can be just as sluggish. You might just need to bring it up to 20 degrees C.
Anyway it's just a cut and try task. You have to put in some time to get a feel for it and be sensitive to what might be going on as you do some testing. I can't be for certain exactly what you are trying to say, or just exactly what you mean by it barely whooshes, if that's the initial first hiss or if it just ran slowly and died. Heh, tomorrow should be summer (68 degrees) The jet didn't woosh because I had welded the pipe tilted. I welded the pipe to the smaller tank and I have gotten it run two times, both around 3 seconds and then it shuts off. The tank without pipe works ok and does 30 second runs before it shuts off. Well you just have to play around with it trying some things. One thing I discovered is that these snorkelers refuse to run if the snorkel isn't a straight shot into the tank. If there is any ridge or narrowing, the air flow and feedback are upset. The snorkel can have a flare or slight staged widening region as it enters the tank but never any lip or peculiarity that interferes or blocks the coherent airflow inside that snorkel. The inside of the snorkel has to be a smooth, straight shot for the piston of air. No narrowing allowed. Maybe you could try a slightly smaller diameter snorkel or try some starts with the tank at a 45 degree angle. Snorkelers can be fussy sometimes. But when you get one going, it's a lot of fun to watch. Good luck and keep an eye out for other tanks or cylinders that look promising. You might find smaller tanks just as much fun with a snorkel. This was my first snorkeler and it was so impressive to me when it reved up. I could only put a very small amount of fuel in it or else it would flameout, the combustion was so violent that the fuel splashed too much inside the small volume and killed the effect. Usually it would run for 5 or 10 seconds at a time but it was fairly loud. These paintball tanks don't like to run straight up but rather at a 45 degree angle. I could never get the most narrow tank here to run nor the baseball bat when I sawed off part of the handle grip. Another view, the most narrow tank on the far left here. Avoid the more extreme length to diameter ratios. Ugh, I'm running out of pipe, might have to start digging old stuff in our house to find some. What if you sold me one? The one with the snorkel might sustain if you angle it at a 30 or 45 degree angle where the flamefront has a better chance of vaporizing the pool of methanol. Don't try it completely horizontal though because the fuel will slosh out and you want to keep the fuel pool somewhat stationary or in the same place as much as possible. Sounds like you are getting close. Sometimes with a tall narrow tank the jet of flames doesn't reach down far enough into the tank to regenerate enough vaporization of fuel. Well I think it lacks gusto, and even though you had 2 liters of fuel in it, which lowers the distance the flamefront has to travel to reach the bottom a little, and in effect changes the length to diameter ratio somewhat, it still seems to lack compression. Recall I have an eight inch diameter tank snorkeler using a 1 inch diameter snorkel, an 8 : 1 ratio. And my snorkel is longer than the one you are using thus offering more confinement so to speak. After watching the clip several times it looks like your snorkel might be a size too big or maybe it needs to be longer. It's often easier to use a too small snorkel than a larger one I have found. It will still run but not ideally. Another thing I suspect is that ideally your tank may be slightly tall for the width of the tank so a longer snorkel may be more difficult but maybe not. If you have really powerful combustion too much fuel can slosh wildly inside the tank and sometimes less fuel is helpful to stabilize combustion. There are so many caveats or exceptions that it's really hard to say anything is written in stone, because often when you change one thing, you end up compromising something else. You might try starting the snorkeler at a 30 degree angle or so. The hot gases want to rise straight up and being on its side fights that convection effect as well as offering a larger surface area of fuel. Here you can see an 8 : 1 inch tank to snorkel diameter ratio and it runs either straight up or angled like this. This tank will even run with 3/4 inch diameter snorkel if you shorten the length of the snorkel to about half the length of the one in this clip. Lastly I had to cut and try a lot of times before I found what worked best for my particular tanks. Every tank is going to be different in some way, you just have to find the best balance between your tank and snorkel or what you've got to work with. Maybe yours just needs a longer snorkel to keep it going. Well you could try cutting the pipe length but try to keep the cut as straight as possible and smoothen any rough edges. Before that though you might try putting the tank in some water for cooling and angle it like the one I had in the pool. There are days when my snorkelers don't like to run and it mystifies me but I chalk it up the air temperature or humidity, even on days that seem well enough to work. The snorkeler has to be able to scavenge enough of the burnt gases and refresh the tank in order to sustain. If you had a narrower pipe that would sleeve inside the one you are using now, you could clamp it in place with a few hose clamps. You would want the sleeved pipe to be flush or even at the bottom with the other one where it enters the tank opening. I was wondering if your methanol is 100% pure or some sort of methanol that is blended with a small amount of other ingredients. Methanol can also absorb a lot of moisture from the air if it is stored with a loose cap or if the tank it was in is opened and closed a lot. Usually though, the larger snorkelers aren't as fussy about fresh methanol but I wouldn't dilute or mix it with any part of the old fuel you were using. Even a small amount of other fuel mixed in with methanol can really ruin performance. Keep your eye out for other possible tanks that might be fun to try. It seems like you are very close to getting it to sustain, it just takes some time to figure out what works. I'm certainly no expert on pulsating combustion but a lot of time was spent trying something different until I got a feel for things. If something doesn't work you have to try something new. This tank is maybe too tall for a typical snorkeler ratio. It's harder to scavenge the bad air at the bottom, if the tank is too tall and narrow I think. It could probably run with a short snorkel but not one as long as the tank. It would have a much better chance if angled, and not straight up as it appears here. And you can't run these tanks with a snorkel completely horizontal either because the combustion will sling the fuel out the snorkel because the combustion is too violent with a typical snorkel attached to a tank. It helps so much to be at an angle though. This small snorkeler with a crazy long snorkel will only run when held at a ~30 degree angle and it's fussy but when it sustains, it runs fine even though at first I didn't think it had much of a chance, looking at how constricted the breathing must be, going in and out a 3/8 inch diameter snorkel which is so long. Here's something you can ponder. This piglet snorkeler didn't want to run this particular day with its normal longer snorkel so this one half as long was used. And notice how it runs fast for the first 10 seconds or so and then nearly comes to a stop and then speeds up again. These are the kind of odd things that can occur. It's water cooled using a long hose to the house. Some other piglet snorkeler photos. This 1.25 inch diameter snorkel never would sustain combustion as many times as I tried. Here's one that abstractly looked like little piglets to me so that's where the name came from. A few other very old photos. This very tall narrow oxygen tank never sustained with a snorkel either. Last edited by Mark on Wed May 11, 2016 2:33 pm, edited 5 times in total. Fileeraus wrote: What defines a reynst pot? I've tried some different fuels and I explain the best one in the video too. I would like to weld a snorkel to it but none of the tubes I've got don't work. 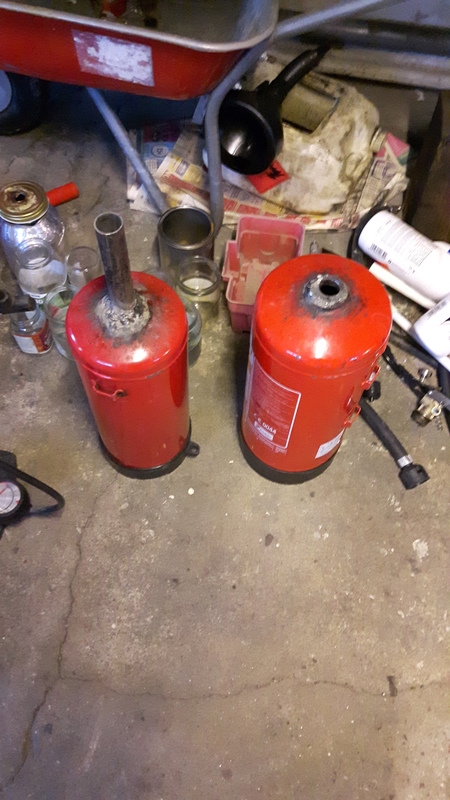 I have used tubes that are (almost) equal size to the original hole in the extinguisher. This sketch is one from Reynt's book Pulsating Combustion. The thing next to it is one one of the forum members made. Here is another of Reynst's designs with an exhaust tube.